Nookal accounts have unlimited users which means access to sections and actions that can be done by each staff member can be customised. Setting up Permissions is a 2 step process and it is strongly recommended to set it up before providing login details to any staff who should have restricted access. 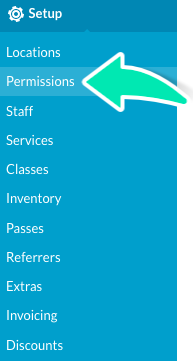 This section explains how to set up Permission groups and how to assign permissions to individual staff members. Make sure to keep at least one user with “Owner” Permissions. This individual is the person that has the ownership of the account and therefore can contact Nookal to enquire about the account. 2. Click Permissions under Setup. In the table displayed, each group has a column to set access to for different sections and actions within Nookal. Default permissions are set up for these groups but it is recommended to review and adjust these settings to suit the practice’s management style. 3. Click on each button to change the access between Edit, View or No access. Edit: Updating, making changes and deleting is possible on the page or for the specific action. View: No changes can be saved but the section can be viewed and reports can be generated. It also includes the ability to print and email. No access: The page can’t be accessed or the action can’t be done. 4. If more permission groups are required such as bookkeeper, different levels of practitioners, etc., click Create New Group in the bottom right corner. 5. 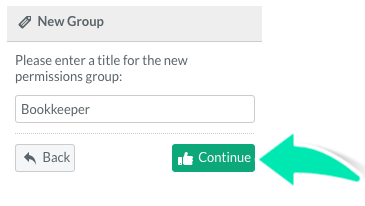 Add a Group Title and click Continue. The group will be created with No Access at the right end of the table. 6. Update Access for the different pages and actions. As the group gets more permissions, the column will move to the left so that groups with the most permissions (i.e. owners) are further to the left and groups with the least permissions are further to the right. 8. 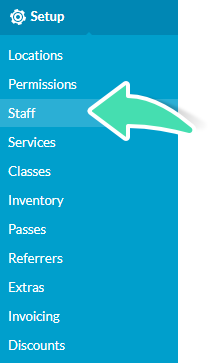 To select which Permission group each staff member belongs to, click Staff under Setup in the left side menu. 9. Click on the staff member’s Name. 10. Click on the drop-down next to Permissions and select the appropriate group. If the staff member has already logged into their account, they will need to log out and log back in to have the updated permissions.